I was watching TV a few weeks back and one channel was re-playing one of Jamie Oliver’s old cooking series – Oliver Twist. Jamie whipped up a baked meatballs-tomatoes dish for his pals that looked really delicious, so I immediately decided to give this recipe a go. I tweaked his recipe a little as I didn’t have cumin and was lazy to get some, so I used dried parsley and oregano for the herb base. I had also added some breadcrumbs that helped yield a tender texture in the meatballs (which I learnt from my previous meatballs recipe). 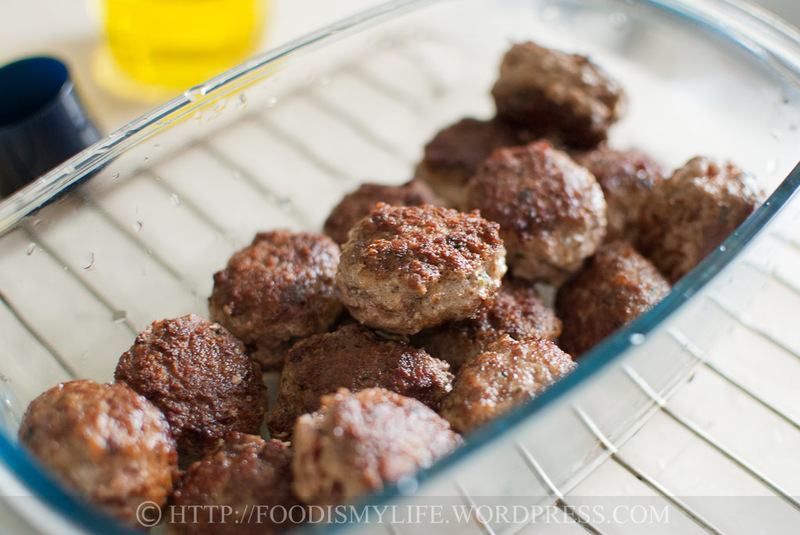 I didn’t soak them in milk this time as I didn’t have milk on hand and I’ve seen plenty of recipes that just add the breadcrumbs without soaking them – and the meatballs still turned out delicious and tender! The tomatoes sauce was not as thick as I hoped it would be – the sauce turned out to be more like a soup, and surprisingly the sauce was pretty delicious! We poured the “soup” generously over the pasta and ate with the meatballs. 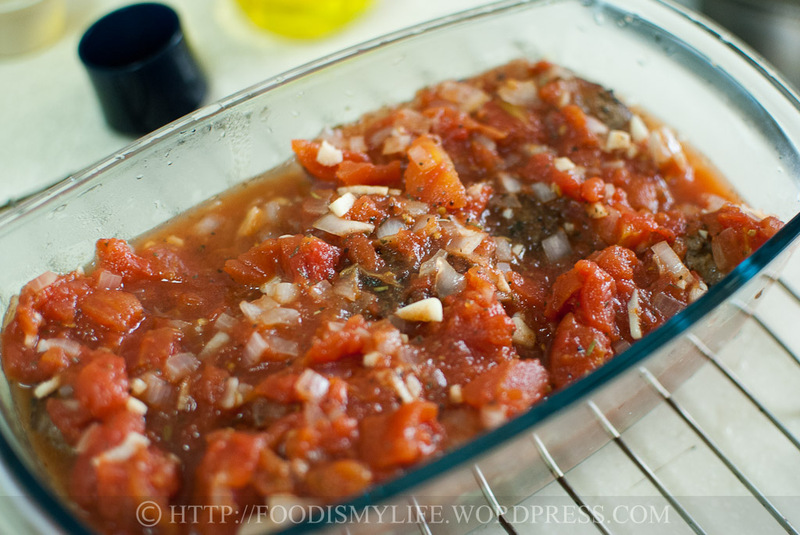 The next time I make this I may add in one tin of tomato paste for a thicker consistency. But the cheeses – oh the cheeses! – made this meatball dish into something extraordinary and it was just so yum. 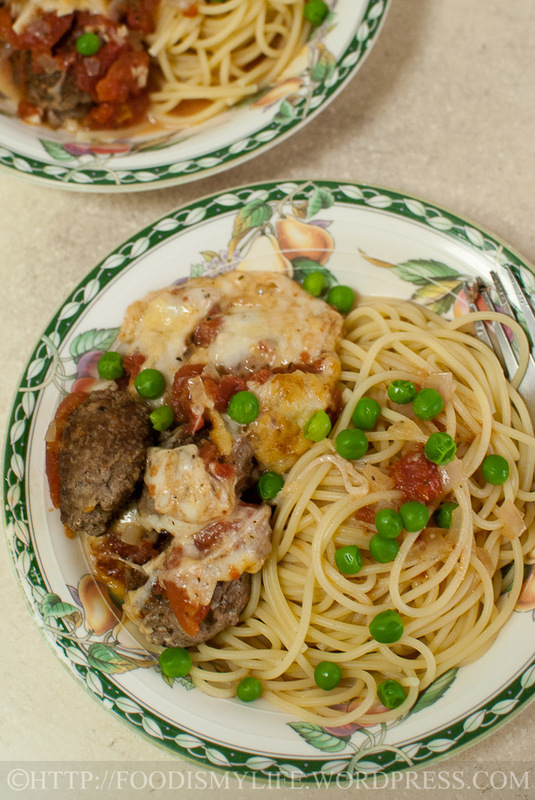 The mozzarella and Parmesan cheeses melted and brown during baking, adhering themselves to the meatballs that were close to the surface of the sauce, creating a cheesy topping for the meatballs. 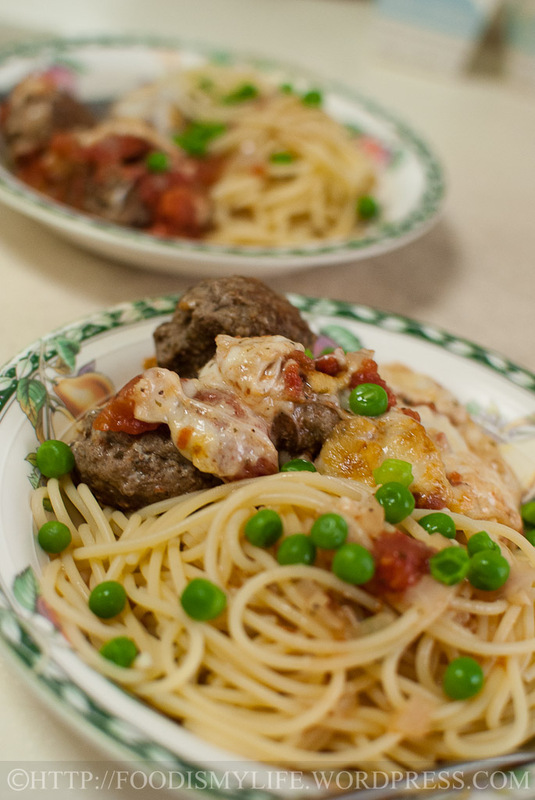 It was really a quick and easy dish and all was ready in 1 hour – from cooking the sauce, making the meatballs, baking them to cooking the pasta – if you managed your time well and had everything ready in your pantry. First cook the sauce as it needs some time to simmer. 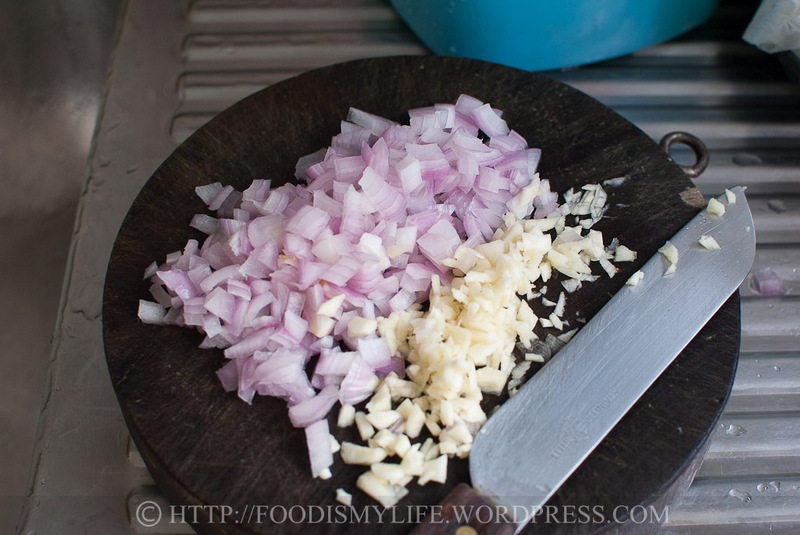 Chop some garlic and onion. Fry them in a small pot until your whole house is filled with a wonderful aroma. 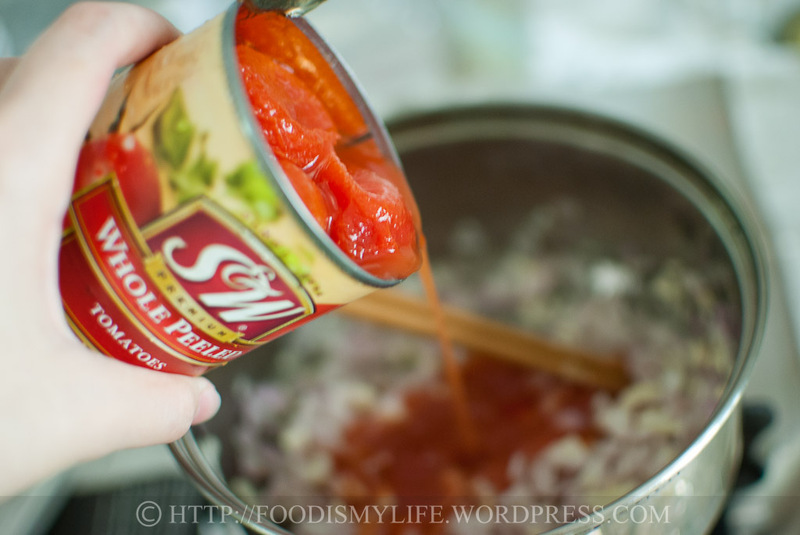 Add in one can of tomatoes. 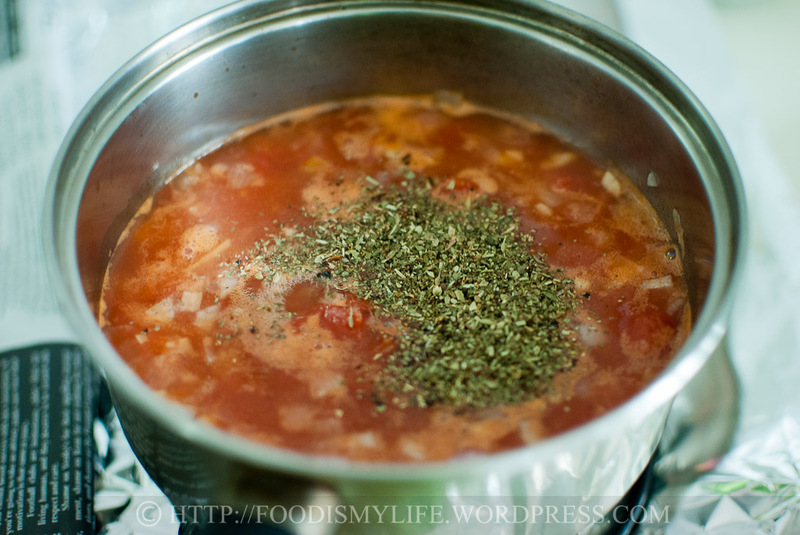 Bring to boil and add in some herbs – I used Pasta Blend that consists of many types of herbs – purely because I’m lazy! Let it simmer away while you prepare the meatballs. 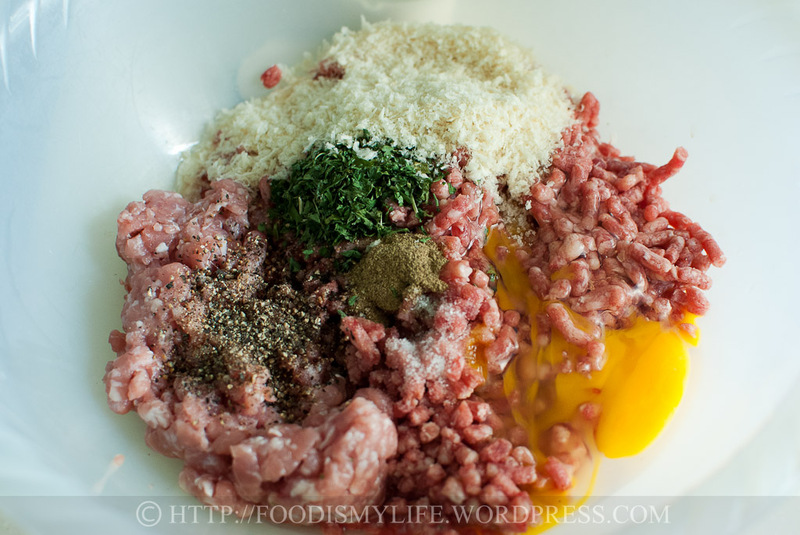 To some minced beef and pork (in the ratio 2:1), add in breadcrumbs, egg, parsley, oregano, salt and plenty of black pepper. Mix it all up with your hands, add a little olive oil if it’s a bit too dry, but not too much until the ingredients are swimming in oil. 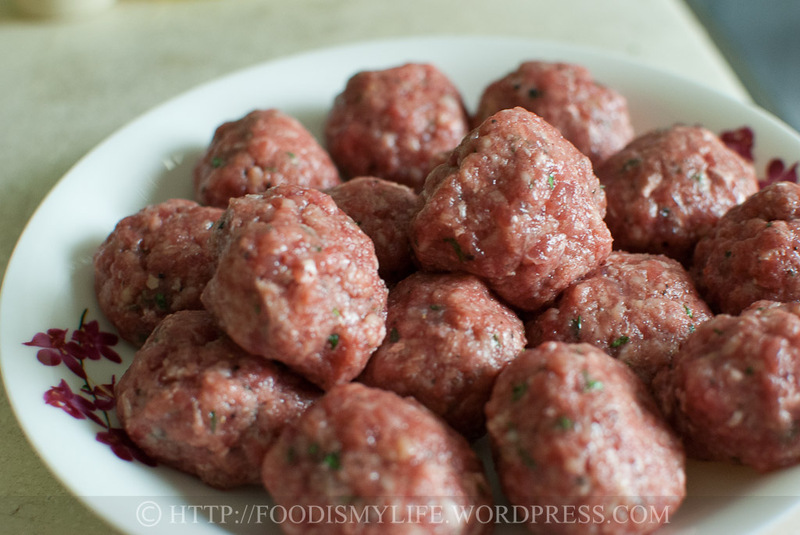 Divide them into large meatballs – about 1.5 inch in diameter. I got myself about 15 meatballs. Heat a large non-stick frying pan over high heat – get it really hot! Add some olive oil and sear the meatballs in batches, adding more oil if necessary. The meatballs would be about 1/2 to 3/4 cooked. It will finish cooking in the oven. Then transfer them into a large baking dish. Pour in the tomatoes sauce. 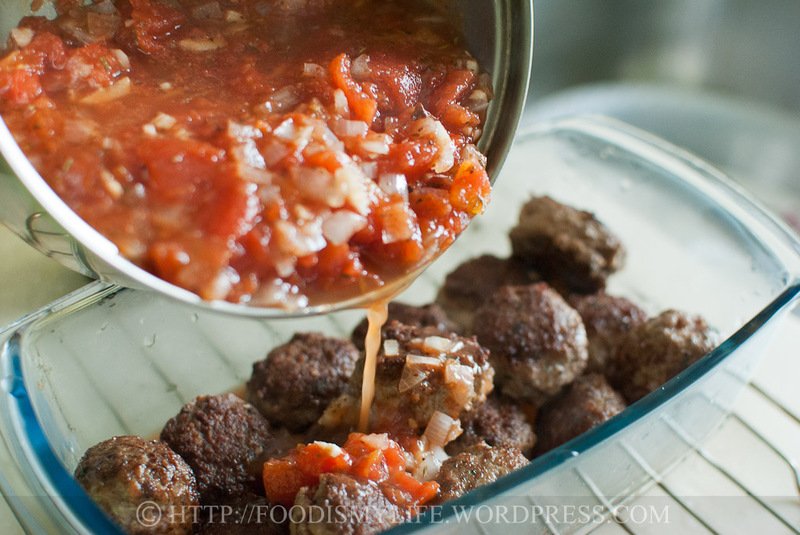 Delicious sauce with delicious meatballs… what more can I ask for? 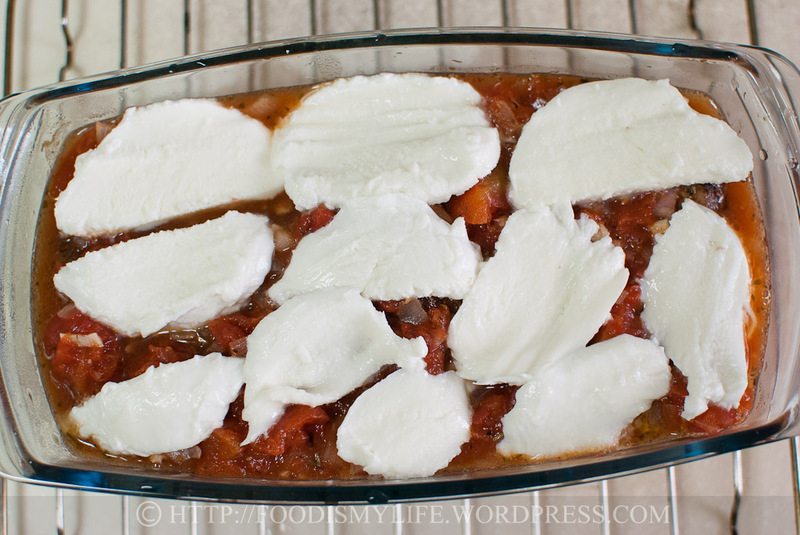 Lay the mozzarella in a single layer on top of the sauce. Followed by plenty of Parmesan. Bake until the cheese has melted and is a beautiful golden-brown colour. Serve with some spaghetti! YUM! I’m submitting this to Zoe’s (Bake for Happy Kids) event – Cook Like A Star! This month’s Star is Jamie Oliver, so if you’re a fan of his dishes, do hop over (click the little froggie) and see what others have whipped up! 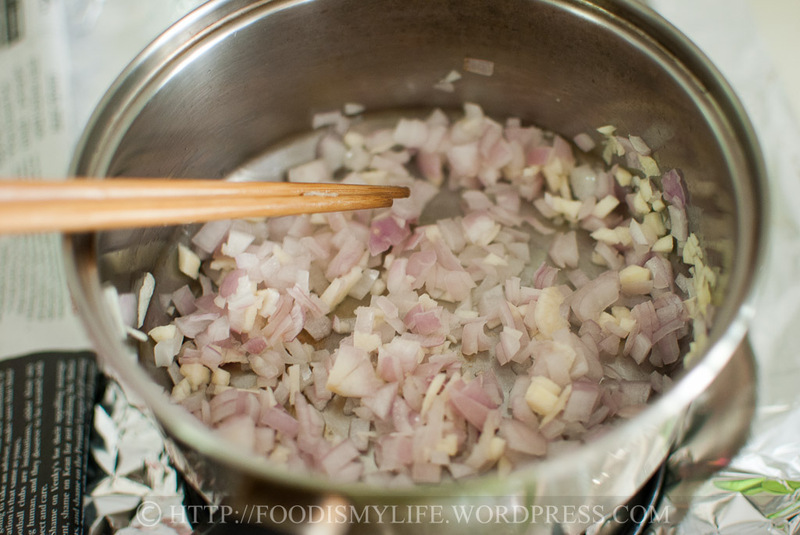 Heat a little olive oil in a small pot and sauté the onion and garlic till onion has softened and is translucent. Add in the tinned tomatoes and bring to a boil. Turn the heat down to a simmer, add in the herbs and season with salt and black pepper. Simmer for 15 minutes till slightly thickened. While the sauce is simmering, in a large mixing bowl, combine the two types of ground meat, breadcrumbs, parsley, oregano, egg and olive oil. Season with black pepper (generously) and salt. Mix the mixture till they are well mixed and slightly sticky. 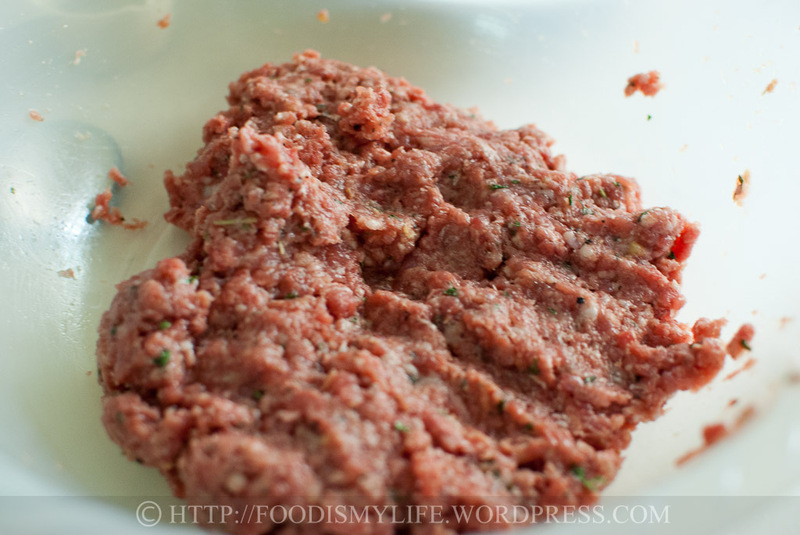 Divide and roll them into 1.5 to 2 inch meatballs. You will get about 16 meatballs. Heat a frying pan over high heat and drizzle in some olive oil. When the oil is very hot, add in the meatballs and sear them until they are browned all over. Remove them from heat and transfer them to the baking dish. Do cook the meatballs in batches if your pan is small, adding more oil if necessary. Heat up the tomato sauce. When the sauce is boiling, pour it over the meatballs. 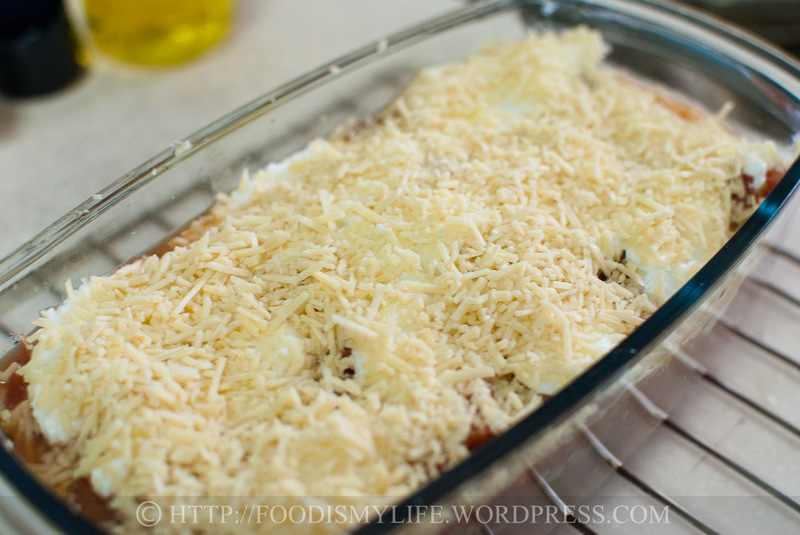 Top with mozzarella slices then Parmesan cheese. Bake in the center rack for 20 minutes until the sauce is bubbling, the cheese has melted and turned into a golden perfection. While the meatballs are baking, cook the spaghetti. Divide the spaghetti among the serving plates. Use serving plates that can hold a little gravy. Let the meatballs stand at room temperature for a couple of minutes, then scoop the meatballs with the cheese over the pasta. Spoon plenty of the delicious and flavourful tomato sauce all over - the sauce would have turned watery during baking, becoming a soup base for the spaghetti! Oh yummy! This looks delicious 🙂 I’ve never thought to bake meatballs before but this looks divine! Oh thank you Zoe! I’m really happy that Jamie Oliver is the theme this month, I got to try and love so many new recipes! Thanks Mich! I hope you would make it soon! 😉 Have a great day ahead! Thank you Bobbi! They were really tender and moist, and with the addition of gooey cheese? Unbeatable combination! Thank you Sibella! It was really delicious! 😉 I can’t wait to make them again! Thank you! Hmmm I shall try cumin with Cheddar in the future! Your pasta looks so delicious! Makes me feel hungry now, which I was not a minute ago! Drooling…..!!!! Hi Jasline, wow, this looks delicious. its lunch time, and this is making me really hungry! Yummylicious… its lunch time and I am hungry! Thank you! If not for Jamie Oliver, I wouldn’t as well! 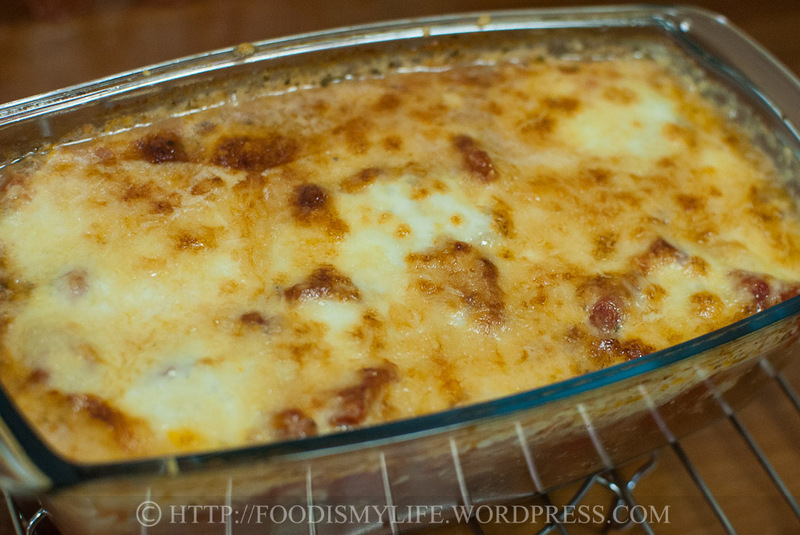 Yummy, cheesy goodness! Fantastic photos! 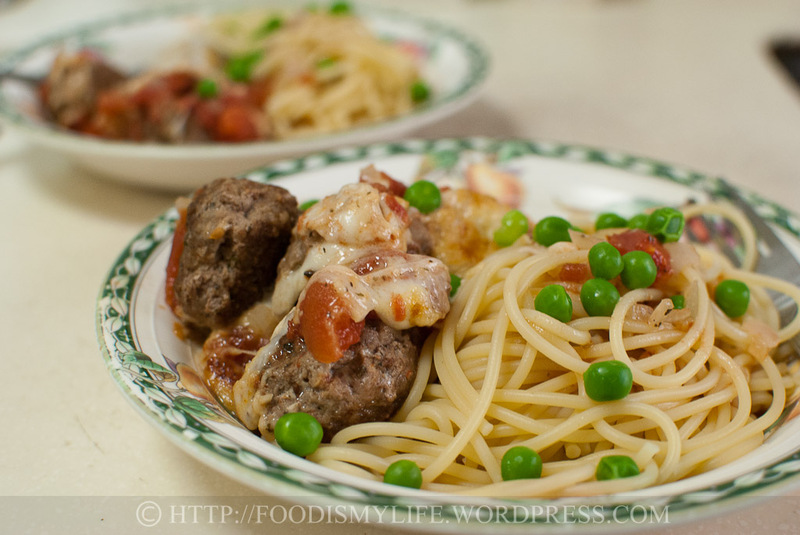 I am loving your Jamie Oliver series and this one with yummy meatballs is no exception. I have either baked or fried my meatballs but have never thought to bake them in sauce. I bet they were super tender and moist. I think you did the right thing with going the herb route. Cumin with mozzarella and Parmensan? Nah, cumin with a mature Cheddar, maybe. Jaime’s recipes have yet to disappoint me and this dish, with all of that glorious cheese, would surely keep the streak going. It sounds delicious! This really looks delicious, I never thought of baking the meatballs like that. Wonderful!